This summer keep the leads hot and the car interior cool with custom car window and sun shades. They're guaranteed to keep your car nice and cool while prominently displaying your logo to the world. Whether parked at the grocery store, mall, or even just at the office, our personalized car sun shades are a great way for hundreds of eyes to see your logo each day. And with such a wide variety of sizes, shapes, materials, colors and style options, you're sure to find the right sun shade that jives well with your logo's aesthetics and the interior of any car. From custom "baby on board" signs to full-size windshield or window shades, ePromos has you -- and your car -- covered. Keep the light on your logo and the heat off your clients' vehicles with these custom sun shades. Custom sun shades are an effective way to promote your business and your brand. Presto custom auto shade will protect car interiors from the sun's rays while promoting your logo. Keep your car looking and feeling cool with this Promotional Car Sun Shade that pops open and folds down easily. Eluminator silver accordion custom sunshades will protect car interiors from the sun's rays while promoting your logo. Static-Dimmer clinging custom auto shade bright see-thru colors will make any logo stand out. AutoHold Side Roller Custom Car Sun Shade protects car interiors while promoting your logo. Eluminator accordion custom sunshades will protect car interiors from the sun's rays while promoting your logo. This small round Dot-Dimmer clinging custom auto shade see-thru design will make any logo stand out. Give your logo maximum exposure with a custom sun shade imprinted with your logo! Presto custom auto shades will protect car interiors from the sun's rays while promoting your logo. This custom car shade protects passengers and contents while displaying your logo. This dark gray Static-Dimmer clinging custom auto shade see-thru design will make any logo stand out. Protect car interiors while displaying your logo with this SUNbuster Custom Promo Car Shade. A collapsible custom auto shade that'll keep your car cool on those sunny days. Keep your car cooler and your brand hot this summer with these custom auto shades. Custom sun shades are an effective way to promote your business and your brand while keeping your auto cool. Wrap around, all weather custom shade, with patented pivot system, protects from sun and snow. Round Side Window Custom Auto Sun Shade - 15"dia. A custom car auto sun shade builds public awareness & consumer appreciation with your message boldly displayed. A custom car sun shade with see-thru design allows for visibility out of window while keeping direct sunlight from coming in. Fan shaped custom sun shade protects car interiors while promoting your logo. Diamond shaped anti-glare custom sun shade, perfect for children & promoting your logo, team or event. Rear passenger custom sun shade protects car interiors while promoting your logo. Presto custom auto shade will protect car interiors from the sun's rays while promoting your full color logo. 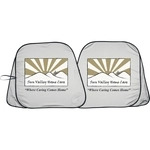 Put your logo on a custom car sun shade to maximize your brand's exposure wherever you go! ePromos offers a variety of shapes and sizes that will keep your car cool and protect its interior from harmful UV rays. Attach a smaller shade to side windows to protect your and passengers' vision from the bright sun while driving. They're perfect for protecting the little ones from the sun; and as an added bonus, our shades will help them fall asleep on those long car rides. Set one up in the windshield while you're parked so you don't come back to a mobile sauna -- these shades are portable and simple to set up so you can take them wherever you go. ePromos has custom auto shades to fit a variety of windshield types and sizes -- expandable, collapsible, wrap around, front roller, accordion and side roller shades. Sun shades come in square, round and fan-shaped designs with features including anti-glare, dot-dimmer, cling, reflective and more. Custom sun shades are a creative and effective way to market your brand in public, whether in a parking lot or in traffic. Browse our inventory to find what's right for you!